4 x 35mm size black & white negatives of Blackburn 16/18/51/78. Salford City Transport - Daimler - TRJ 112. Stick 6 - Bus 3 - 025. Add to Favourites. Dated August 1983. The photo has been pre-owned and in good condition. 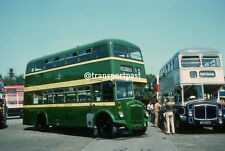 A 6x4 colour photograph of North Western Leyland Atlantean 411 RTF625M. This is a professionally produced colour print. View us to see much more ! The image is from a collection kindly supplied to us by Mike to raise funds for vehicle restoration projects. Another Quality transport photograph from "Transport Nostalgia". Redline- W203EAG;. Volvo B10M-Plaxton-June 2008 Original 35mm colour slide;. The actual slide is clear and in focus. It is possible that the slide may have suffered age related colour fading or scratching. Selwyn Runcorn YN10FKO;. Volvo B9L-Plaxton Feb 2011 Original 35mm colour slide;. The actual slide is clear and in focus. It is possible that the slide may have suffered age related colour fading or scratching. A 6x4 colour photograph of C Line Leyland Olympian DOG110 GFM110X taken in Manchester Oct 1990. This is a professionally produced colour print taken from my original slide. BOLTON CORPORATION TRANSPORT. LEYLAND PD2/4. FLEET NUMBER 430. BODY WORK BY LEYLAND. NEW IN 1949. BOLTON CORPORATION TRANSPORT. LEYLAND PD3/4. FLEET NUMBER 159. BODY WORK BY EAST LANCS. NEW IN 1961. Yorkshire Rider Halifax Leyland Fleetline Northern Counties 7208 - PTD650S ex GM Buses - low res image - your print is sharp with no light reflections!Good Condition. Here, with Lancaster, it carries No.582. Yorkshire Rider Halifax Leyland Leopard Plaxton 1531 - JUM531V - low res image - your print is sharp with no light reflections!Good Condition. A 6x4 colour photograph of Greater Manchester Leyland Titan 5801 YDB1 taken in Manchester Sep 1978. This is a professionally produced colour print taken from my original slide. 1 x bus photo as listed Taken 2016. A 6x4 colour photograph of Warrington Leyland Atlantean 75 REK75R taken in Warrington July 1981. This is a professionally produced colour print taken from my original slide. G M BUSES. LEYLAND ATLANTEAN. Blue Triangle Liverpool Leyland Leopard Alexander T Type PRA113R ex Trent - low res image - your print is sharp with no light reflections!Good Condition. This is a professionally produced colour print taken from my original slide. WALLASEY CORPORATION. LEYLAND ATLANTEAN. THE WHITE LINE DOES NOT APPEAR ON THE PHOTOGRAPH..
BOLTON CORPORATION TRANSPORT. LEYLAND PD2/27. FLEET NUMBER 133. THE WHITE LINE DOES NOT APPEAR ON THE PHOTOGRAPH.. Produced Print donated to the charity by UKBUSPHOTOS. _gsrx_vers_612 (GS 6.9.5 (612)). BOLTON CORPORATION TRANSPORT. LEYLAND PD2/37. FLEET NUMBER 125. THE WHITE LINE DOES NOT APPEAR ON THE PHOTOGRAPH..
BOLTON CORPORATION TRANSPORT. LEYLAND PD2/37. FLEET NUMBER 127. BODY WORK BY M C C W. NEW IN 1959. THE WHITE LINE DOES NOT APPEAR ON THE PHOTOGRAPH.. THE WHITE LINE DOES NOT APPEAR ON THE PHOTOGRAPH. BOLTON CORPORATION TRANSPORT. LEYLAND PD3/4. FLEET NUMBER 132. BODY WORK BY EAST LANCS. NEW IN 1959. LONDON TRANSPORT. 6 X 4 PRINT. Taken by us 2019 at Blackpool. 6" x 4" Black & White Photograph Of Manchester Corporation, Leyland Atlantean PDR1/R Double Decker, Fleet No. EX L U T. LANCASTER CITY TRANSPORT. BODY WORK BY PLAXTON..
Taken May 2017. Why not take a look at our other photos new stuff arriving every 2-3 weeks. This is a professionally produced colour print taken from an original slide. Taken in 1973 at Whitehaven. Leyland National. 35mm Black and White Negative. BOLTON CORPORATION TRANSPORT. LEYLAND PD2/37. FLEET NUMBER 124. BOLTON CORPORATION TRANSPORT. LEYLAND PD2/27. THE WHITE LINE DOES NOT APPEAR ON THE PHOTOGRAPH. SELNEC P T E. EX BURY CORPORATION. THE WHITE LINE DOES NOT APPEAR ON THE PHOTOGRAPH. Bristol Lodekka. Taken in 1973 at Whitehaven. 35mm Black and White Negative. 1 x bus or coach (as listed) photo as listed Taken 2016.